Well this seemed simple enough. The design for our radiator mounting brackets hadn't changed in months, which we took as a sign that everything would work. So we dug out the MGB radiator and held it up in front of the frame where the brackets would go, and darned if the lower outlet tube didn't run smack dab into the nearside nose tube. We couldn't have planned that any better if we tried, and of course we wouldn't expect anything less from our build than some kind of irritating interference problem with every new part we try to fit. 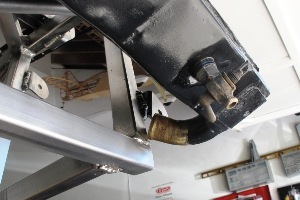 So we had to move the radiator up and out, where hopefully it won't interfere with the nose cone, which of course it will unless our luck suddenly changes. 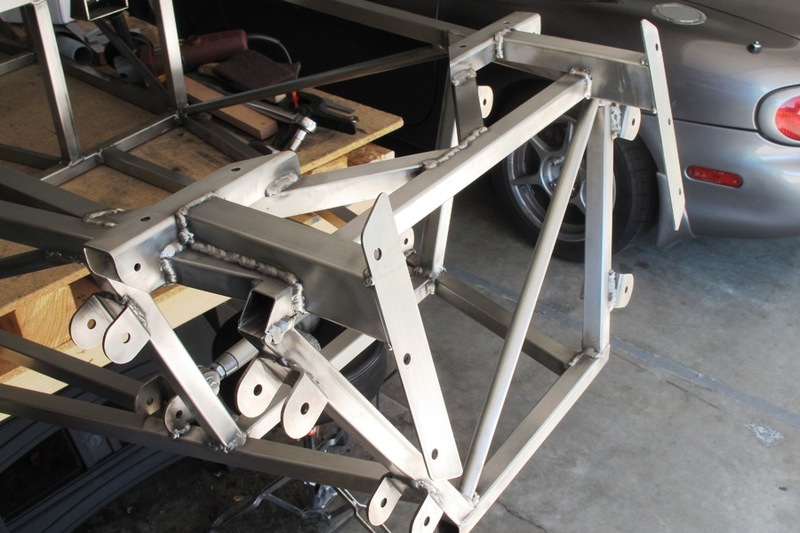 Moving the radiator away from the frame would also place a lot more stress on the mounts, but we figured the same trailing-edge technology that went into our semi-professional shock mounts would work for the radiator, i.e. big heavy steel tubes welded to the frame. So that's what we did, in part because we figured the radiator mounts would be a lot easier to make than the shock mounts. But of course they weren't, because the odd angles of the frame and the shock mounts wouldn't let them fit. The big tubes forced us to use every grinding and filing tool in the shop, and by the time we were done the tubes were a good 1/4" shorter than they were when we started. 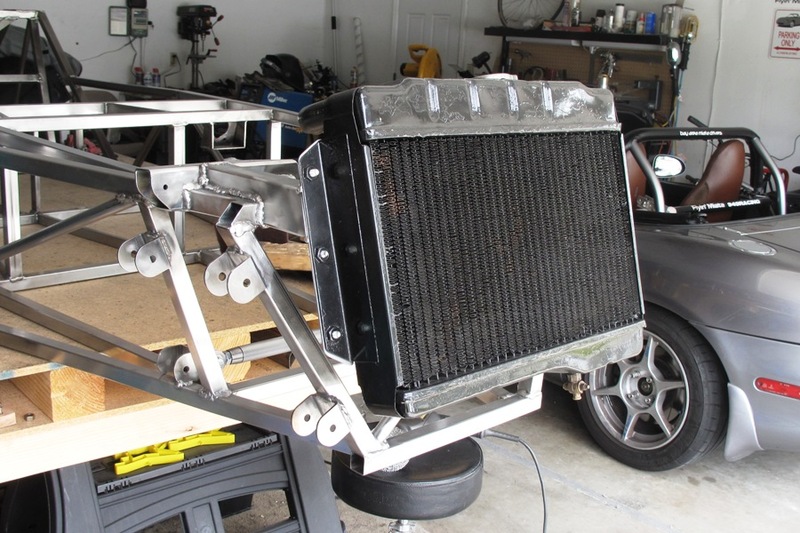 A test-fit showed we still had plenty of clearance for the lower radiator tube, or if not plenty then at least enough, so we cut and drilled the mounting strips and even contoured them to the shape of the radiator tabs for that extra special factory look. Then, using the radiator itself as a jig, we tacked them in place. The good news is, all of those giant tubes have to be helping to keep the front of the frame together. It's entirely possible we have the strongest Locost front end in history. We also like how the radiator sits up almost straight, even though the book says it should lean back more. Something about nose clearance. We tried leaning it back, but it looked stupid. The filler cap was lower than the top of the upper tank, which would've made filling the thing all the way impossible. So we're happy with it where it is, and we're going to make the nose fit no matter what. And so the radiator is in, at least for now, although we're going to have to remove it a few times in order to do things like fitting the steering rack and installing the engine. It's pretty obvious how the radiator bolts to the frame, so I don't think we'll need to add an entry to our workshop manual, but one thing I think we still need to do is add some reinforcing tubes between the lower half of the 1/8" mounting strips and the nose tubes. Right now the strips are free to flex like popsicle stocks, and so of course they will if we don't put a stop to it first.